Mumbai has seen an explosion in the number of two-wheelers on its roads, with the city home to around 16 lakh bikes (as of March 2016). This effectively translates into a two-wheeler density of 798 bikes per km of its roads. Given these numbers, it is not surprising that most accidents in the city involve bikes. Mumbai had over 2,500 recorded accidents in 2015, resulting in the loss of 611 lives. Two-wheelers accounted for 146 deaths on Mumbai’s roads. 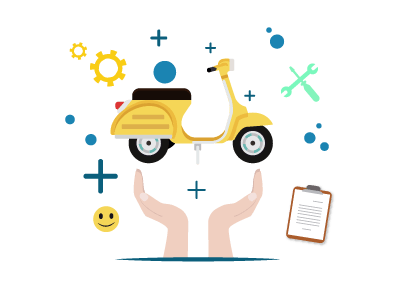 A good two-wheeler insurance policy can help offset any monetary loss associated with such accidents, with the government making it mandatory to have a vehicle insurance. *The aforementioned list highlights only the popular options in Mumbai, and does not rank them in any specific order. Insurance companies which offer motor insurance typically tie up with garages across India to provide cashless services. This not only helps simplify the entire process, but helps one get a damaged bike fixed without having to shell out money from their pocket. Mumbai is home to a number of cashless garages, with it possible to locate one by either of these means. Utilise the ‘network garage locator’ on the official website of the insurer. Most companies offer this service on their website, helping one find a network garage closest to them. Contacting customer care representatives of the insurer. These representatives can help one find a cashless garage in Mumbai or anywhere else in the country. Some insurers provide the list of network garages in their brochure/policy document. Cashless garages are designed to offer a range of comforts and benefits to policyholders, with a few of them listed below. Quality service – Getting a bike fixed at unknown garages comes with the risk of having parts replaced with duplicate/damaged ones. Getting the bike fixed at a network garage ensures that this doesn’t happen. This helps prevent further breakdown of the vehicle in the future. One can also be rest assured that the work isn’t incomplete. Hassle-free – Getting a damaged bike fixed at a network garage is typically hassle-free. One has to follow a simple procedure, intimating the insurer, with all finances and other documentation related to the bill handled by the insurer. Quick – A network garage is likely to fix the bike quicker than a regular garage. Lower expenses – Getting a bike fixed at a cashless network garage results in limited/no spending from one’s own pocket. One is only expected to pay an amount if the cost of repair exceeds the amount covered by the policy. Replacement – Insurers often provide replacement vehicles while the insured vehicle gets fixed at a network garage. A bike insurance isn’t just a necessity, it is also an investment which can help protect against any unforeseen incident involving the bike. As such, one should keep a few basic points in mind before buying the policy. Policy inclusions – Each policy comes with its own set of inclusions. Opting for a policy which does not cover certain basics could leave one high-and-dry in case of an accident. Read the policy carefully to see all the instances which are covered, ensuring that the exclusions are limited. Policy type – There are two types of policies available, third-party liability cover and comprehensive cover. While a third-party liability plan covers the basic requirements, a comprehensive plan offers enhanced cover. Premium – The premium one pays for a plan depends on a number of factors like the bike model, age of bike, policy type chosen, place of registration, etc. Mumbai, being a tier 1 city attracts a higher premium charge compared to tier 2 cities. Comparing policies from various insurance providers can help one get a good deal on their premium. Policy period – Most bike insurance plans come with a period of 1 year, meaning that they need to be renewed annually. A few insurers offer plans with a tenure of 2/3 years, eliminating the need to renew the policy each year. Discounts – Insurers provide incentives to individuals in the form of No-claim Bonus (NCB). The NCB helps reduce the premium amount, with it increasing each year a claim is not made. Additionally, discounts are also offered based on the policy period. Claims process – One should check out the claims process of an insurer before purchasing a policy. The entire process should be simple and quick, for delays in claim settlement could have an adverse impact on the finances of an individual, resulting in increased stress. The used bike market in India is worth about $10 billion, with over 15 crore bikes on sale. While most of us transfer the bike ownership after selling/buying a used bike, there are instances where the insurance policy is not transferred to the new owner. This could result in cases where the insurer rejects a claim if the vehicle is involved in an accident. To avoid this, one should ensure that the insurance is transferred in the name of the individual purchasing the bike. Contrary to popular belief, transferring the insurance from one person to another is not complicated, with it possible to do this in a few simple steps. Contact the insurer and inform them about the sale. State the intention to transfer the bike insurance policy in the name of the new owner. Provide details of the sale to the insurance company. This includes the registration certificate and the no-objection certificate from the regional transport office. Ensure that the new owner meets the basic eligibility criteria for the policy. In case of accumulated NCB, one can choose to apply for a NCB certificate. This ensures that the NCB earned can be utilised by the original owner of the bike. The policy will be transferred to the new owner once the insurer completes these basic formalities.